Some fellas would sell their souls to idle on the sidelines as padded gladiators try to shove an over-inflated football down their opponent's throat. I, however, am not one of those fellas. What can I tell you: sports was never my game. A day-dreamy lad more at home in the stacks of my local library than on any field of play, I passed through adolescence without ever learning how to root, root, root for the home team. Okay, there's more to it than that. Let's just say I was born without the chromosome that enables one to give a rip about things like scoreboards, time-outs and color-coordinated uniforms. All of which makes my access to the NFL nothing less than ludicrous. 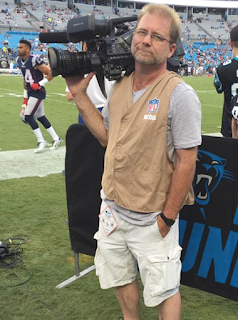 See, if you man a fancycam in this town, eventually you're going to find yourself at Bank of America stadium, that holy shrine of gridiron glory known as the home of the Carolina Panthers. To most, it is a Mecca. To me, it is a mystery: a place where oversized athletes zig and zag in a most convoluted manner, where full grown fan-boys in matching sweatshirts genuflect every time some chiseled millionaire passes gas, where sports reporters bandy about terms that leave a word-nerd like me reaching for a thesaurus that's forever out of reach. Just how clueless am I? I've been gleefully hating on the band Nickelback for damn near a decade without ever realizing their very name was a football term! I thought running a route referred to dashing to the bathroom during one of those incessant TV time-outs! I assumed a blitz was the state of mind all those tailgating fans were pursuing in the parking lot! I'm not even kidding! Well, maybe a little. What I can truthfully attest to is that I know I have no business skulking along the field's perimeter, dive bombing the press room food table or trying not to get too many cutaway shots of the cheerleading squad. Mostly, I keep to myself, be it in the the odorous bunker where the camera crews loiter during halftime or on the sideline, where even a fraction of distraction can land you in a body-cast. See, you don't have to grasp every play's ramifications to know that if even one of those players you've been struggling to keep on screen lands in your lap instead, you'll be drinking your next month of meals through what's left of your spleen. That's one game day sensation I can live without. So if you spot me on the sidelines sporting that thousand yard stare, know that I'm not just bored out of my skull, I'm forever afraid I'm gonna wake from said stupor with my beloved lens shoved down my gullet. Then who would get all those artsy shots of the cheerleaders?